Slick Rock Road is a great scenic route with a few challenges along the way. Although not as difficult as near by Deer Valley I would argue Slick Rock is more fun to drive. Along the trail you will find great views of Alpine Lake, Silver Creek and the Sierra Nevada mountain range. Slick Rock Road is referred to as a road because it was once a paved service road. Along the trail there are still areas of concrete visible. Because of its short length and relative ease the trail only takes a few hours to run but also offers some great camping opportunities along the trail and Silver Creek. 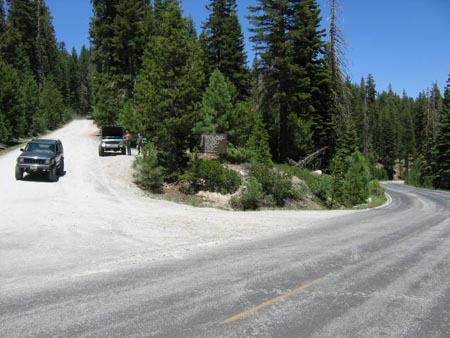 Northern Access - Slick Rock Road is generally run from the North to the South beginning to the West of Alpine Lake and ending near Utica Reservoir. The trail is accessed near a campground one quarter mile West of the Alpine Lake market. Trailhead - The trail officially begins a short distance from Alpine Lake and (0.8 miles) beyond Highway 4. During this section of the trail you will come across "No Trespassing" / "Private Property" signs, continue on the road as the signs reference the surrounding property and not the road itself. Silver Creek - Along the beginning of the trail you will see Silver Creek to the East and follow it to a clearing that is perfect to setup camp. The water sheets across the granite and into pools along the river. Sloped Granite Wall - Use caution in this area as it is lightly off camber. The granite wall makes for a great photo and a little challenge. Also at this point you are almost half way through the trail. 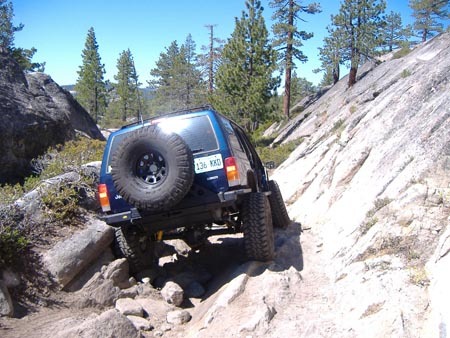 Slick Rock - This section of the trail is steep and long with a short drop at the bottom. There is a bypass as it maybe difficulty for less equipped vehicles to make it up from the South to North. Also concrete from the original road can be seen in this area. The Stairs - This is the Southern most obstacle on the trail as well as the most difficult. There are several smaller rocks along the bottom of the obstacle followed by a medium sized rock in the middle of the trail. After making it over this rock there are several "steeps" on a large rock to make it up. Duck Creek Bridge - The Duck Creek Bridge will take you over the North Fork Stanislaus River. The bridge was reconstructed in 1983 by the Joaquin Jeepers of Stockton. Staging Area (Southern) - The Southern staging area offers plenty of parking and access for trailers. There are also several surrounding lakes and reservoirs to fish and kayak. Check with the Forest Service website for motor and speed restrictions. * Trail distance does not include return milage for "out & back" trails or extra mileage due to optional "by-pass" trails. ** Elevation range is base on the National Elevation Dataset for the lowest and highest elevations along the trail.